1 of 3 Soak Kamut in cold water overnight. Drain. In a medium lidded pot, add Kamut and 41/2 cups water. Cover and bring to a boil. Reduce heat to low and simmer 30 to 40 minutes, until tender. Drain and cool. 2 of 3 Shred Brussels sprouts with a food processor slicing blade or a coarse grater. 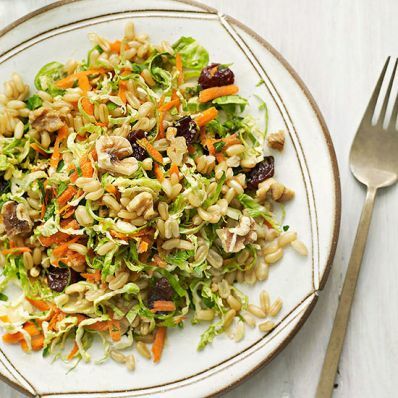 Mix with Kamut, carrots, cherries, walnuts and parsley. 3 of 3 In a small bowl, whisk olive oil, lemon juice, honey, salt and pepper. Stir into salad. Serve at room temperature or chilled. Per Serving: 6 g fiber, 43 g carb., 2 g sat. fat, 0 mg chol., 347 mg sodium, 7 g pro., 14 g Fat, total, 305 kcal cal.